The new generation of compacts is approaching lower middle-class cars in both their features and dimensions. Proof of this is the new Ford Fiesta, a completely mature automobile that refuses to be called “little”. FROM FIRST GLANCE, the new Fiesta resembles the larger Focus model, not only because the shape is similar. With a wheel base of 2486 mm, the total length of the new car closes in on the four meter limit (3917 mm) providing enough space for both passengers and luggage. Fiesta has, of course, variable luggage space, the basic volume of 284 liters can be increased to 947 l by folding down the back seats. The modern chassis, with front-mounted engine and front-wheel drive, distinguishes itself with excellent driving characteristics comparable to cars of a higher segment. 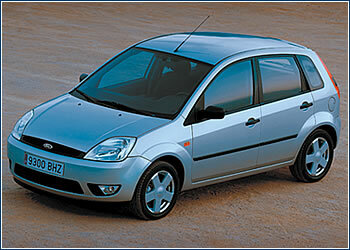 On the Czech market, the Fiesta is sold with four levels of options – basic, Ambiente, Trend and Ghia. The least expensive five-door model with a 1.3-l, 70-hp (51 kW) gas engine costs CZK 299,900. More demanding drivers can get cars installed with a 16-valve, 1.4- or 1.6-l four-cylinder engine, with output of 80 and 100 hp (58 and 74 kW). The Fiesta, driven by a 1.4-l TDCi turbodiesel engine with output of 68 hp (50 kW), offers an economical alternative. It reaches 164 km/h and has an average consumption rate of only 4.4 l of diesel per 100 km. With the Ambiente package, it is available for CZK 391,900 while the luxury package Ghia costs CZK 437,300.